Eddie of Guitarville By Vegas (see links below) is video demoing his inventory these days. And he's got vintage inventory alright! The featured '65 has a 6100 jumbo re-fret, 80's nitro refinish, Earvana nut and non-orig. 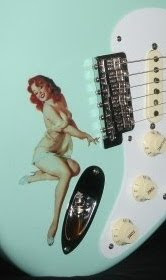 pickguard- although period correct. Otherwise, the lumber, hardware and electronics are 1965. The audio in clip #2 says it's all Strat. And where would it all be without Eddie's Madonna pick!!! All Ed's stuff is vintage, and price pointed for deep pocket collectors. It sells when it sells. Don't assume the Madonna pick is included.